Lyme Disease (Lyme borreliosis) is the most common tick-borne disease in the United States and in Europe. The disease is caused by a bacterial infection acquired from the bite of an infected Ixodes tick or more commonly called a deer tick or the black-legged tick. Deer ticks, in their early stages of development, usually live on small rodents where they become carriers of the Borrelia burgdorferi, a spiral-shaped bacteria (spirochete). When the infected tick bites another animal, like your dog, the bacteria is passed on to your Schnauzer. Deer ticks are very small, so inspect your dog regularly. Keep in mind Lyme disease affects people, too. Deer ticks (Ixodes scapularis) are just one of the bloodsucking arachnids that can transmit diseases to your Miniature Schnauzer and to you. (See Rocky Mountain Spotted Fever). So always protect yourself and your dog when spending time outdoors. If you find a deer tick on your Miniature Schnauzer, remove it immediately. You have but a 48 hour window once the tick attaches to your dog to remove it before infection begins. ***Read How to remove a tick from your dog. Treating the disease involves the use of antibiotics. The treatment is usually lengthy in order to completely eradicate the organism. So checking your Miniature Schnauzer on a regular basis for ticks is very important. Ask your vet about the use of monthly tick control products that kill all the life stages of common ticks so your dog can live a tick-free life. The best way to prevent Lyme disease in dogs is to prevent tick bites. 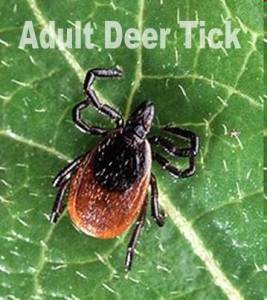 Avoid areas where these bloodsucking parasites thrive: woody areas, tall grassy areas, and brush, especially during tick season where they are waiting to jump on a passing host. And be sure to use tick repellents and other tick control or preventatives to keep them at bay. 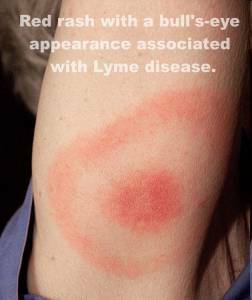 Lyme disease symptoms in humans include feelings of lethargy, achy joints and just feeling achy all over, headaches, and developing a red circular rash with a bull’s-eye appearance. Lyme disease can also affect the heart and spread to one's nervous system causing facial paralysis. Patients with Lyme disease who are diagnosed early, and receive proper antibiotic treatment, usually recover rapidly and completely. Without treatment, complications involving the joints, heart, and nervous system can occur. Take extra precautions in May, June, and July when ticks that transmit Lyme disease are most active. Walk in the center of trails to avoid contact with brush and overgrown plants. Wear light colored long-sleeved shirts and pants. Keep pant cuffs tucked inside your socks or shoes. Again, deer ticks that carry Lyme disease are very small. So always check yourself and your Miniature Schnauzer thoroughly during and after hikes. "Protecting your dog or cat from fleas and ticks is an important part of responsible pet care. Although there are many brands of over-the-counter flea and tick products available at supermarkets and pet supply stores, it is critical to read their labels and consult with your veterinarian before using them on your companion. These products may contain ingredients that could harm pets and children. Generally speaking, flea and tick treatments widely available in supermarkets are not recommended. Never use dog treatments on cats, and vice versa." Use topical flea & tick treatments with caution: Topical flea and tick preventatives are pesticides and all pesticides pose some health risk to our dogs. These chemicals can circulate and accumulate in our Schnauzers' bodies, doing unseen damage to vital organs (like the kidney and liver) which could go undetected for years. And then there are those dogs that show immediate signs of pesticide poisoning with just one use. For some of these dogs, damage is permanent or can be fatal. Symptoms of poisoning by flea/tick treatments may include allergic reactions (hives, itching, other skin irritations, and respiratory distress), excessive salivation, dilated pupils, shaking, twitching, vomiting and diarrhea. If your Miniature Schnauzer shows any signs of poisoning contact your veterinarian immediately! Read flea and tick product labels very carefully to ensure the product is designed for your dog. (age, weight, health issues, etc). Avoid buying the cheaper Grocery Store topical treatments just to save a few dollars. It could end up being a very expensive trip to your vet's office. Consider using holistic & natural flea treatments instead of chemicals to keep those nasty insects off your dog. Always seek advice from your Veterinarian before using any flea or tick treatment on your dog. Feed your Schnauzer a healthy diet and consider adding a good dog supplement to boost your Schnauzer’s immune system. A high quality natural diet can improve your Schnauzer's overall health and strengthen his immune system which in turn helps to repel insects. Bathe your Schnauzer with a non-toxic, natural herbal defense flea shampoo to keep pests at bay. Thoroughly vacuum your home on a regular basis paying special attention to areas around your Schnauzer’s bedding. It's also a good idea to wash your dog's bedding at least once a month. Use organic pesticides for fleas and ticks to protect you yard. Use a flea comb to remove fleas and flea eggs, as well as other small insects or annoying debris from your dog. Knowledge Share... If you found this article on Lyme Disease in Dogs helpful and informative, please share it with your dog-loving friends by clicking on one of the share links (like facebook, twitter, and google +1) located at the top right or bottom of this page. 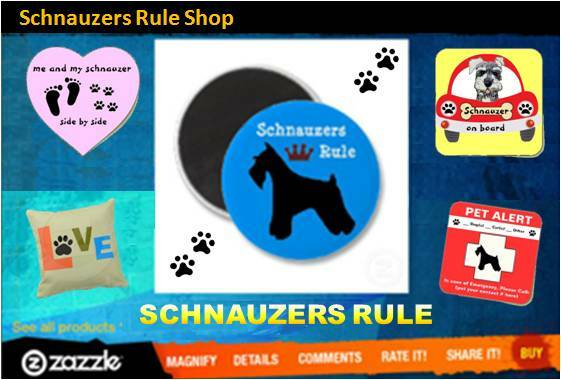 ★ Top 6 Dog Tips to Keep Your Schnauzer Cool This Summer.